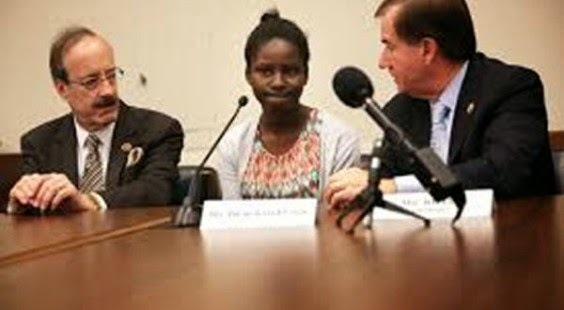 15 year old Deborah Peter, a Chibok indigene who now resides in Virginia, USA, was at the Capitol Hill, D.C yesterday May 21st, where she narrated her experience in the hands of Boko Haram. 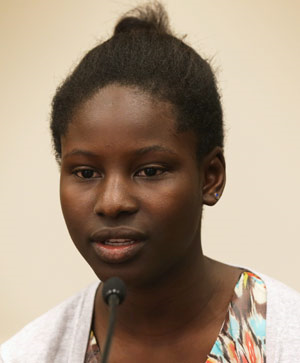 Deborah was at the US congress in her capacity as a Boko haram survivor, to lend her voice to the #bringbackourgirls campaign, as members of the congress debated on how to effectively win the war against the radical Islamic sect that abducted over 200 girls in Chibok on April 14th. Deborah said she was then asked to lie in between their corpses. She laid there until the next morning when she was rescued by a local Pastor who paid for her to be transported out of the region. Sadly, the pastor who assisted her was also killed in 2013 by the sect men. During her presentation, Deborah held up a paper sign reading “#BringBackMySisters” for video cameras and photographers.